I’m sure by now you are aware that Under The Stars – The YouTube Sensations will be happening this week. Do you want to meet the six talented YouTube Sensations? 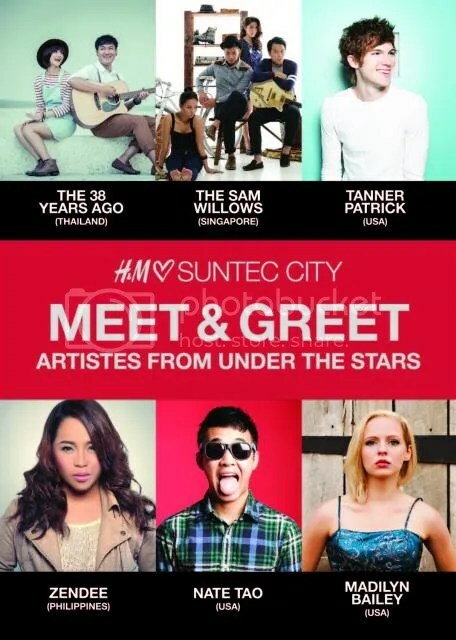 H&M Singapore’s newly opened store at Suntec City is proud to host the Under The Stars – The YouTube Sensations meet & greet session on 27 June 2013 (Thursday) at 7pm! Be the first 200 to attend the meet & greet session and receive an autograph as well as a pair of invites to the Under The Stars concert! In addition, you will be able to watch a live performances by the artistes. Do not miss this chance to catch Tanner Patrick, Madilyn Bailey, Nate Tao, Zendee, The 38 Years Ago and Singapore’s very own pride and joy, The Sam Willow on 27 June!